Utilities: Tenants are responsible for power/gas/water, plus tenants pay $75 for trash/sewer. Gorgeous two story home in this private gated community in a beautiful area of Gold River. This home was built by Tim Lewis Communities and is properly maintained by a home owners association to keep the gated community looking beautiful. This home is conveniently located close to shopping and parks with miles of walking and biking trails just across the street as well as access to the CSUS aquatic center for kayaking, paddle boarding and more. This home has a very open feel to it from the minute you walk in the front door with the spacious family room, large raised ceilings and open kitchen area. The master retreat is located downstairs with its own sliding glass door to the private backyard, a large master bathroom with huge shower and separate bathtub. Upstairs there is a large loft that over looks the family room, built in bookcases, full bathroom and two more bedrooms. The backyard has a built in BBQ grill that is already hooked up to gas, so no need to go buy propane! There is also a large built in outdoor fire-pit, perfect for entertaining family and friends. 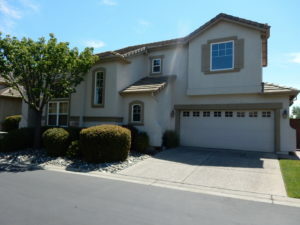 This home is in the San Juan School District and aligned to the highly rated Gold River Elementary School.